On the final day of New York Fashion Week, Michael Kors paid homage to the legends of Studio 54, spinning a tale of a Broadway dancer-by-day who spends her evening revelling in the ritzy enclaves of New York’s most famous nightclub. Barry Manilow provided live music, singing ‘Copacabana (At the Copa’ while models—typically stiff and stoic—swayed along in a surprisingly loveable, camp and kitsch affair. The models, with their hair fashioned in tight curls, took to the runway in layers of crushed lamé, extravagant fleece coats, and flouncy party dresses dripping in feather trim and crystal embroidery. 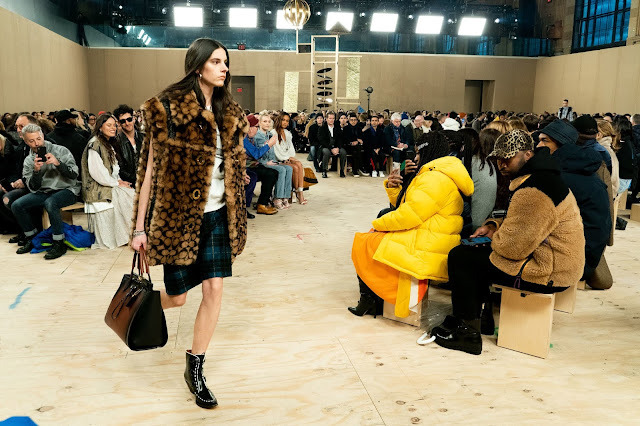 From lacquered leathers in animal print to fur-trimmed jackets, Kors touched all bases. For the guys, there were tank tops emblazoned with the Studio 54 logo, flared denim, and buttoned-down patterned shirts. However, was lost in a sea of womenswear. Kors likes to make his fashion as easy as apple pie. He spared no expense on explicit references to the 1970s. It’s why Stuart Vevers take at Coach 1941 was much more nuanced in his approach and, thus, more successful in its execution. His latest offering was influenced by youth culture in the decade that brought the collision of punks with hippies, glam rock and disco, and the evolution of skate and biker cultures. Vevers is skilled at taking American history and making something desirable out of it—if it’s not wholly compelling, it’s modern. Alongside plaid tailoring and floral print dresses accented with black ruffles, he presented his strongest menswear to date. His propositions skewered tailoring and streetwear, seamlessly catering to the two markets by bringing them together. Whether it was joggers or tapered trousers, everything was styled with sneakers. His man could have easily stepped out of Gia Coppola’s youth culture odyssey Palo Alto, or quite simply, a Californian suburb. Wait for high street retailers to copy it. It’s with the times, even if he didn’t push it forward. On Tuesday night, Laura Kim and Fernando Garcia, the designers at Oscar de la Renta, went in the opposite direction. For Kim and Garcia, the question is simple: how do you infuse the tasteful proclivities of the uptown elite with a modern, urban sensibility. It’s the guiding light in their collections. Their attempts aren’t always auspicious but they have come quite close for Fall. They fused the Islamic and Christian history of the Mosque-Cathedral in Córdoba, Spain. The duo assimilated the disparate worlds of gloriously eclectic pattern and fluid silhouettes—in rich shades of vermilion, ochre, and gold—and the subdued elegance of black, white, and grey. They showed daywear, using fabrics traditionally associated with menswear, for all ages and glamourous evening wear for all occasions. The main attempt was to thread a global line through the work—nothing was supposed to feel rooted in one city. Oscar de la Renta, of course, is a global brand, and it showed. 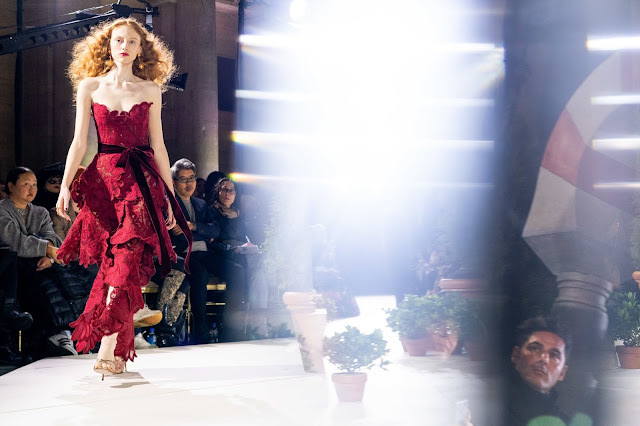 The standout was a floral-embroidered lace dress in a sublime shade of crimson. A veritable update on the flamenco dress, it could also be read as an homage to the late Mr. de la Renta’s Spanish roots. Furthermore, Kim and Garcia’s modernity was rooted in practicality and femininity. Trousers and asymmetrically-cut blouses, funnel-neck sweaters and oversized tailoring finally clicked with the evening wear portions. A comprehensive vision for their iteration of Oscar de la Renta finally makes the most sense for the time it's being presented in. Kudos to them—and management—for taking the time to work things out.